Our NGS assays use a combination of PCR target enrichment, followed by NGS and Sanger sequencing. Our comprehensive PCR primer library and our extensive experience with primer design ensure robust amplification of every target. Mutations and novel variants are always confirmed by re-PCR and Sanger sequencing. Gap filling of targets below cutoff is done by re-PCR and Sanger sequencing. 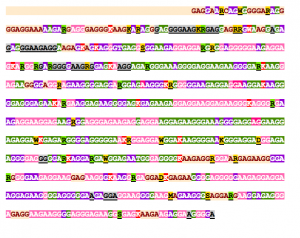 RPGR ORF15 is arguably one of the most difficult to sequence coding regions in the human genome. Unfortunately, most of the mutations in RPGR are in this region (usually frameshift mutations). This region cannot be covered by most standard methods. Since mutations in RPGR can be found in isolated cases (with no family history indicating X-linked inheritance), sequencing RPGR ORF15 becomes essential in order to have a comprehensive and thorough analysis. At Molecular Vision Laboratory, we have developed a unique method to sequence ORF15. The region is first enriched by long range PCR and then sequenced by Illumina Nextera XT and MiSeq. We have validated the in-house method by sequencing ~ 200 samples tested elsewhere. Our efforts on the sequencing of RPGR ORF15 and several other hard-to-sequence regions differentiate our service from many others. In order to reach to 100% mutation detection rate, we will continuously improve our platforms and we will continue to develop necessary and cost-effective methods. The most difficult to sequence region in RPGR ORF15: (hg19), p.800-1030 (Highly repetitive, G & A rich region).